Below are matching bridle and breast collar sets for sale on Amazon and eBay. Well, sort of. Most of the items below are actually headstall and breast collar sets. 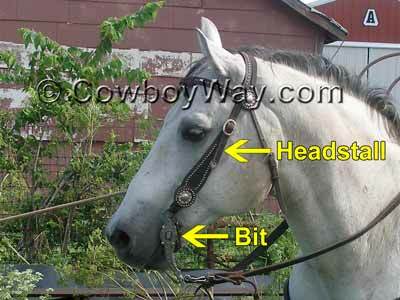 Loosely defined, a headstall is a bridle without the bit (or nose piece, etc.). For more information on bridles and headstalls please scroll down underneath the items for sale. A bridle is a piece of equipment put on a horse's head to communicate with it while it is being ridden. A bridle is made up of two basic parts: 1) a headstall, which serves as a hanger for a bit, and 2) a bit (or related piece of equipment such as a bosal, nose piece, etc.). It's not uncommon to hear a headstall, by itself, referred to as a bridle. Technically, of course, this isn't correct but it's sometimes done when horse people - including the ones that know the difference - are speaking casually. Below: The two main parts of a bridle. A breast collar is a piece of equipment added to a saddle that helps to keep the saddle in the proper place. A breast collar attaches to one side of the saddle, then goes across the front of the horse (aka the breast) and attaches to the other side of the saddle. The primary job of a breast collar is to keep the saddle from sliding too far back, but it can also help to keep the saddle from tipping side-to-side. Breast collars are considered by many horse people in both English and Western riding disciplines to be an essential piece of equipment. 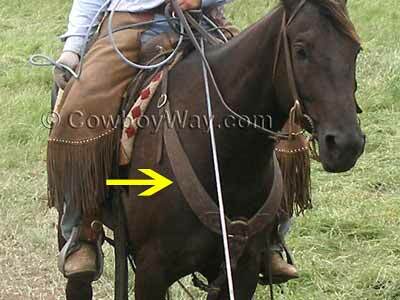 Below: A breast collar (yellow arrow) that matches the headstall. If you find a bridle and breast collar set on Amazon that you like but you're not ready to purchase it right away, you can always add it to your shopping cart so it will be easy to find later. In most cases, Amazon.com will keep track of your bridle, breast collar, and anything else in your shopping cart, for 90 days. Later on, if you decide you don't want the items after all it's easy to click "delete" and remove them from your cart. In the meantime, if you want to check out with other items, click "Save for later" to move the bridle and breast collar to a separate, but still easy-to-find list beneath your shopping cart. Important: Putting items in your Amazon shopping cart or "Save for later" list does NOT reserve them! It just makes them easier to find if they're still in stock when you come back. Below: Screenshot image showing the "delete" and "Save for later" links when an item is in the Amazon shopping cart. If you found this page useful or interesting and would like to link to it from your own website or blog, you can use the small code snippet below to make a link. Thanks! Use ctrl+C in Windows or command+C on a Mac to copy the link. Below: Like and share this page on Facebook!